View More In Cocktail Picks. These durable and nature friendly 6-inch bamboo skewers are perfect for piercing and serving mini-kabobs and bite-sized morsels. Their uncomplicated design adds a rustic and user-friendly touch. Whether it's grilled shrimp, cheese cubes, strawberries, plum tomatoes, olives, cuts of steak and chicken, or any other savory appetizer, these grilling skewers are the ideal choice for restaurants, parties, galas and catered events. These Bamboo Spears are 6 inches in length, and are shipped in bulk in a 1,000 count box. ELEGANCE AND STYLE: These bamboo skewers add a touch of refinement to drink service, wedding receptions, galas and banquets. FUNCTIONAL: An ideal way to skewer cheese, fruit, olives, shrimp, and other appetizers, as well as a stylish garnish for cocktails and drinks. VERSATILE: Perfect for weddings, hotels, catered events, restaurants and other establishments that focus on rustic settings. SIZED RIGHT: At 6 inches, these bamboo skewers are the ideal size for most cocktail glasses and cups. 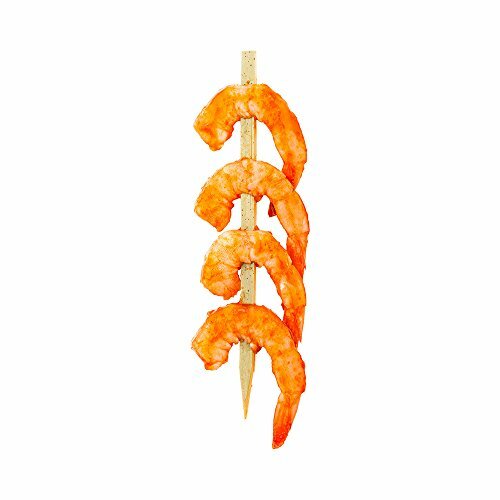 SOLD IN BULK: These bamboo grilling skewers are shipped in bulk in a 1,000 count box. If you have any questions about this product by Restaurantware, contact us by completing and submitting the form below. If you are looking for a specif part number, please include it with your message.